Phast Phreddie the Boogaloo Omnibus and Sir Charles Gaskins swing at the CHEETAH BEAT! The CHEETAH BEAT is another in a growing line of WANG DANG DOODLE presentations—this one featured the top DJ skills of Sir Charles Gaskins. He’s been in several bands, runs Killer Diller Records, works on the cool Bananas magazine and on the last Friday of the month he DJs Finger Lickin’ Fridays at the Grand Victory—which usually keeps him from swingin’ at The Commodore on the fourth Friday of every other month, when Phast Phreddie the Boogaloo Omnibus holds down the DJ booth with various friends. However, with a rare fifth Friday in May, Mr. Gaskins was free to swing on May 23, when clientele of The Commodore were treated to the super boss sounds of The CHEETAH BEAT! Mr. Gaskins played the perfect combination of raunchy R&B, sizzling soul and grungy garage records that go over so well at The Commodore. Indeed, the place was jumping all night, with dancers, prancers and romancers filling the dance floor, spilling drinks and eating the super fine fried chicken that The Commodore is so famous for. Speaking of dancers, also on the scene was The Boogaloo Bag’s favorite Go-Go dancer, Nancy Gardner. In fact, it was her birthday and she chose to spend it doing the watusi at The CHEETAH BEAT! DJ Phast Phreddie the Boogaloo Omnibus used this opportunity to play some of her favorite songs (surf music) and artists (The Ventures! ), theme songs from TV shows that she digs so much and other songs that may refer to her in obvious (“Oh Pretty Woman”) and perhaps not so obvious ways! Phast Phreddie the Boogaloo Omnibus poses with birthday girl and Go-Go dancer Nancy Gardner at the CHEETAH BEAT! Subway Soul Club Springs into Action!! 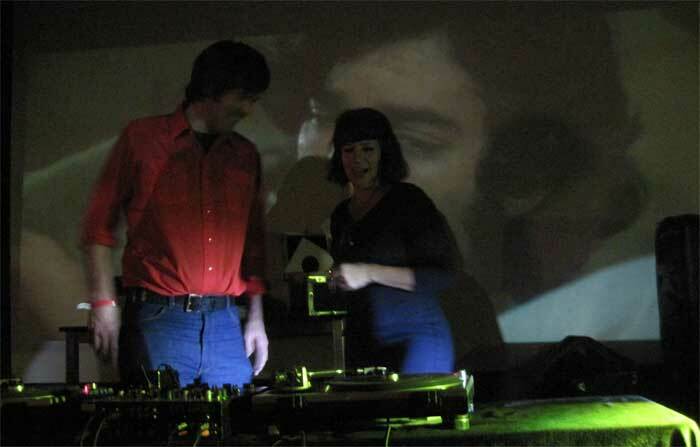 DJs Ambassador Hazy and Bossy Boots consult with each other when spinning 45s at Subway Soul Club. Wow! Did it really happen? Yes it did! SUBWAY SOUL CLUB returned to the Metro-Brooklyn area with a fabulous event on Saturday May 17. Fearless leader Lady Dawn was successful in rounding up the dancing troops, who piled into the lovely Greenpoint bar known as Coco 66 and swung the night away. Resident DJ Phast Phreddie the Boogaloo Omnibus was able to convince the groovy Bossy Boots to fly back to Brooklyn from her home in New Orleans just to DJ for this night only. Also, DJ Ambassador Hazy—who nearly two years ago fathered a son—was able set aside his parental duties and come out of retirement. 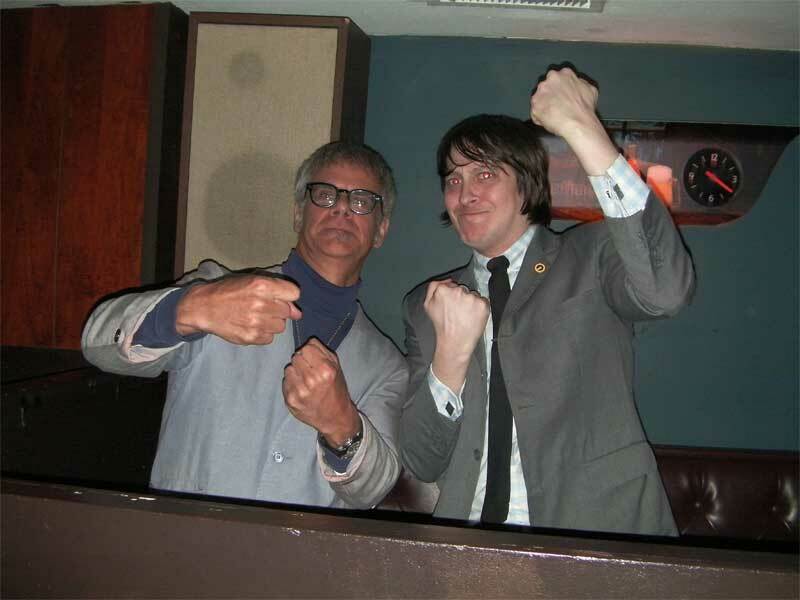 Ambassador Hazy selects another great record to play at Subway Soul Club. And what records were played!! Bossy Boots poured it on with swingin’ New Orleans second line beats and boss blues-inflected soul tracks. Mr. Hazy packed the floor by playing hard-hitting R&B records. Meanwhile, The Boog kept folks dancing by playing some old favorites as well as some recent acquisitions. The sound of sweet soul music filled the air, along with the sound of leather hitting the hardwood floor! Bossy Boots cues up the next record at Subway Soul Club. All night long, every attendee danced and drank with great big smiles on their faces, knowing that there is nothing in the world like the SUBWAY SOUL CLUB!! That Lady Dawn really knows how to make a happening happen! 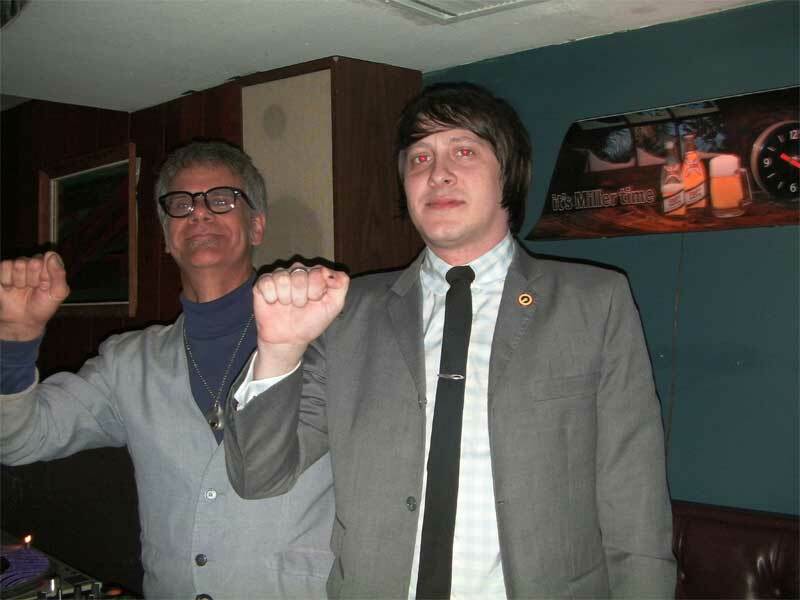 With any luck, there will be another SUBWAY SOUL CLUB dance party in the early fall. Stay tuned, Batman! Dancers swing at Subway Soul Club! 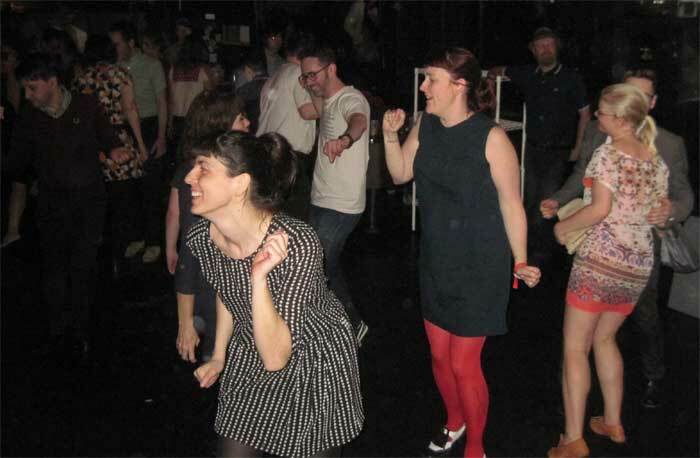 Bossy Boots and Lady Dawn swing at Subway Soul Club. After the party, the Subway Soul Club Crew pose for pictures: Phast Phreddie the Boogaloo Omnibus, Ambassador Hazy, Bossy Boots and Lady Dawn. Dynagroove is up to Nogood! Phast Phreddie the Boogaloo Omnibus and Nogood Nick swing at the DYNAGROOVE! 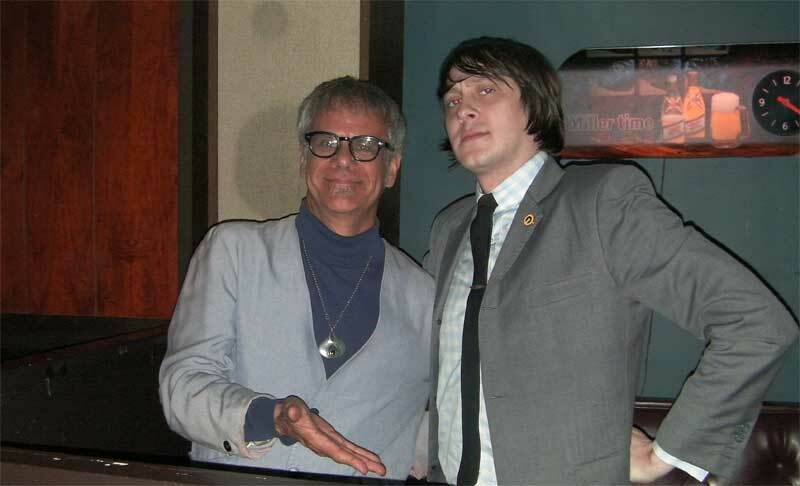 The merry month of May brought the DYNAGROOVE back to Teddy’s Bar & Grill with a whollop!! 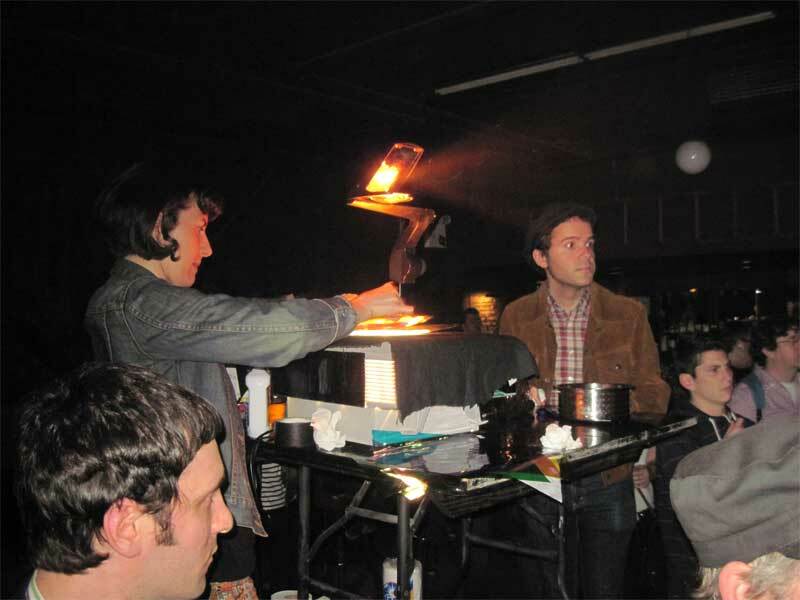 The place was jumpin’ with folks dining and grooving all night long. 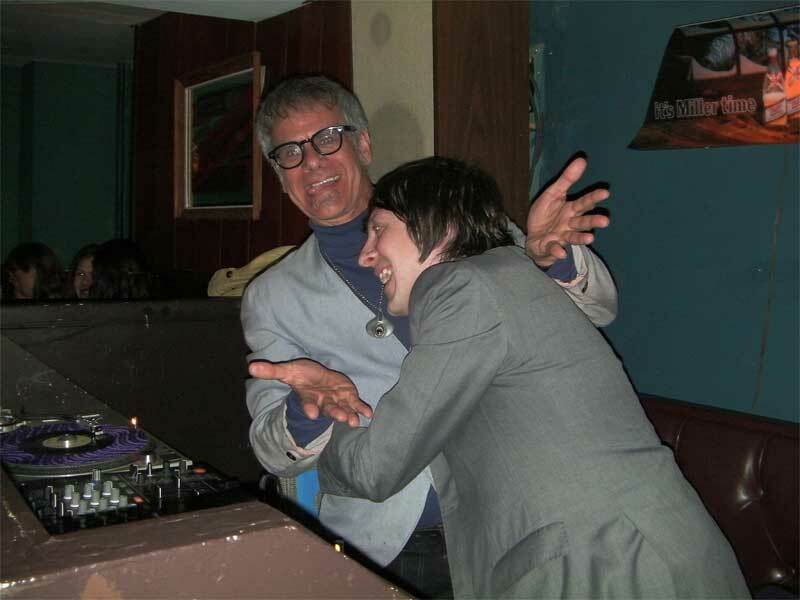 Guest DJ for the night was Nogood Nick, who brought some truly groovy records: Olatunji, organ grooves, Latin soul, Brazilian beat, Roland Kirk, etc. Most of these fine recordings were being played while Host DJ Phast Phreddie the Boogaloo Omnibus was chewing on the most excellent calamari this side of the Newtown Creek! Also, he was very happy to see some of his friends who dropped by to dig the scene. DYNAGROOVE scenesters drop by Teddy’s to dine and groove! 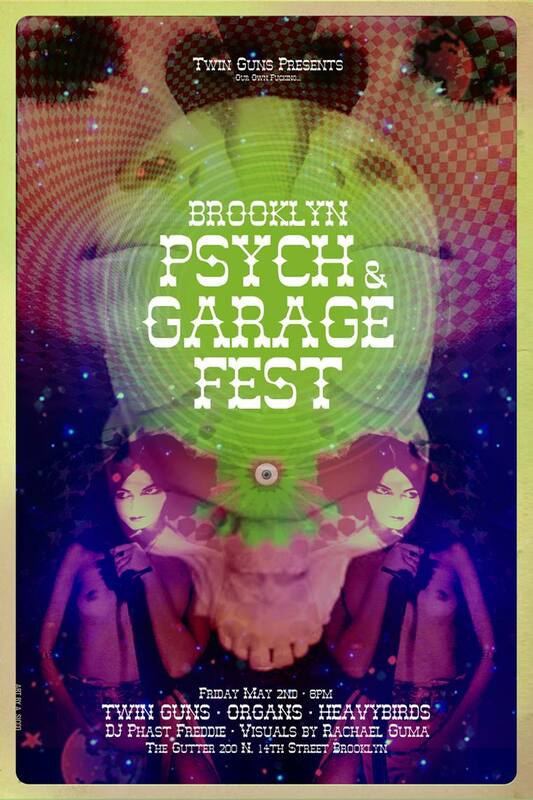 Boogaloo Psyche & Garage Fest! 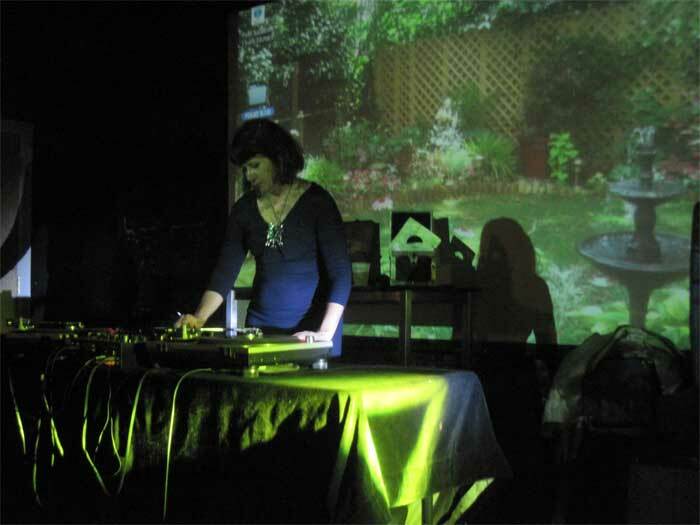 Rachael and Gabriel Guma make with the psychedelic lights at the Brooklyn Psych & Garage Fest. 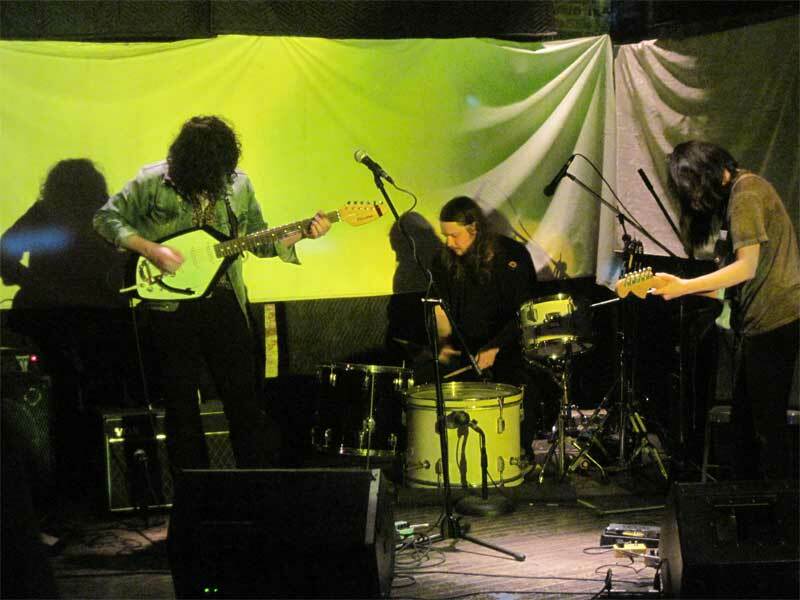 The Brooklyn Psych and Garage Fest was a totally heavy happening that happened on Friday, May 2 at the Gutter in Williamsburg, Brooklyn featuring some of our favorite local rock bands: Heavybirds, Organs and Twin Guns. The evening commenced with the Heavybirds, who unleashed a loud, unholy drone of guitar buzz that set the scene. The trio consists of two guitarists and a cat who banged on a bass drum: truly boss! With their tight songs and solid rock beat, the Organs were the most conventional group of the evening. The writers of The Boogaloo Bag have seen this act before and they dig it the most! Twin Guns, who set up the night and closed the show, were once a guitar-drum duo, but recently added a bass player to the ranks, giving the group a more full sound. 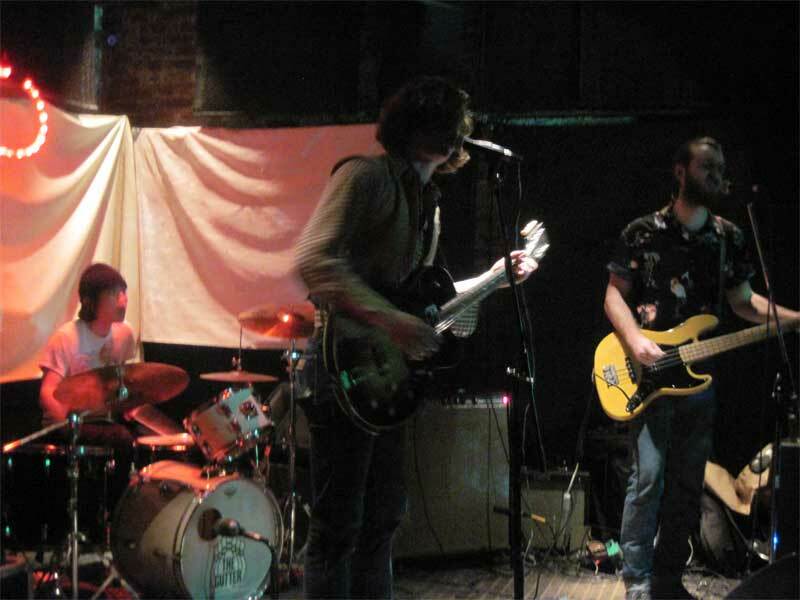 At a Twin Guns show you will be overpowered by tough, surf-influenced, spaghetti western soundtrack guitar playing. 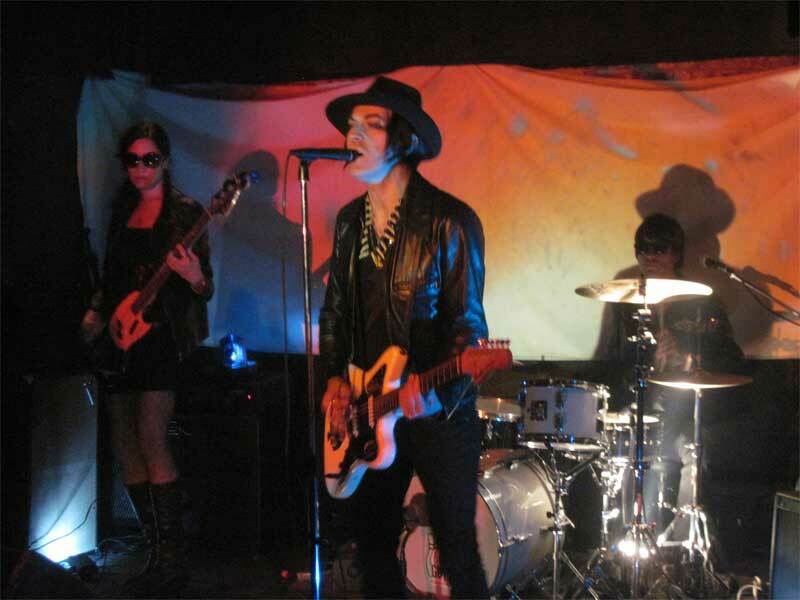 Twin Guns emits vibes ala the legendary Suicide group and is also reminiscent of The Cramps at their most psycho (and less “billy”) moments. With all members dressed in black and wearing sunglasses, Twin Guns make a memorable sight—especially when you add in the full presentation of lights and smoke machines! Plus, any rock band that opens its set with a mutant version of “Harlem Nocturne” and closes it with a fine interpretation of “1970 (I Feel All Right)” is OK by The Boogaloo Bag! Speaking of lights—one of the top features of the Brooklyn Psych and Garage Fest was the most excellent and artistic back-wall lighting of Rachael and Gabriel Guma, who incorporated dyed oils on an overhead projector and a slide show ala the old Fillmore Auditorium light shows. It was a gas! Non of these records are for sale. Boogaloo Number 9 Takes Off for the Planet Venus! Phast Phreddie the Boogaloo Omnibus blows as Miss Nancy Jeannie Gardner shakes her maracas at the Sun Ra’s Prophetika book launch at St. Mark’s Church in the Bowery. 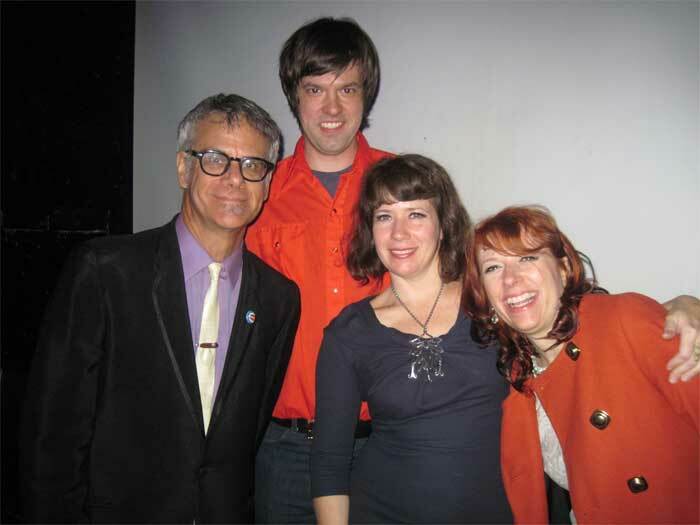 Photo by Amy Verdon. 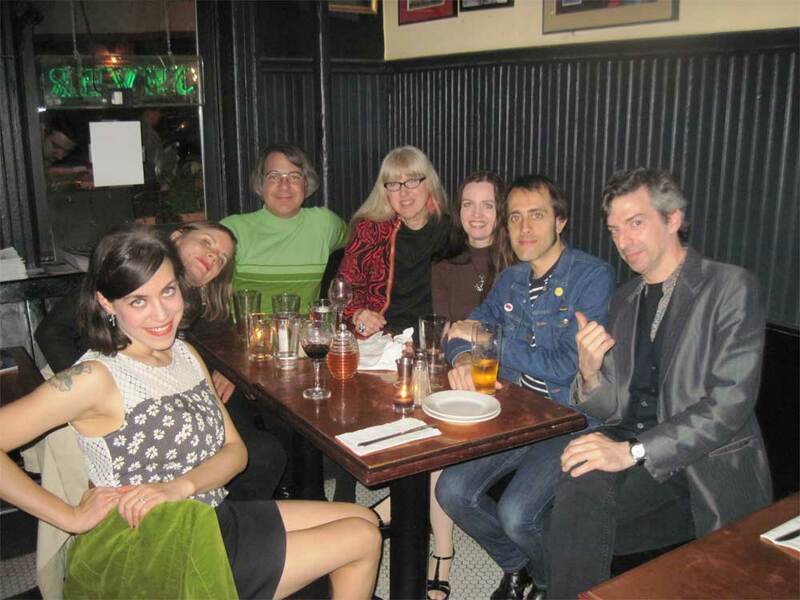 Kicks Books is part of the Norton Media Empire that includes Norton Records, Kicks Magazine and the boss raunch and roll combo The A-Bones, and is run by our friend Miriam Linna—a fine example of a human being that The Boogalboo Bag writers have been acquainted with since 1975. The books division has published fabulous and important works by such writers as Harlan Ellison, Royston Ellis, Nick Tosches and Charles Plymell. Also, Kicks Books has given printed vent to bonafide musical types: Andre Williams, Kim Fowley and Sun Ra. 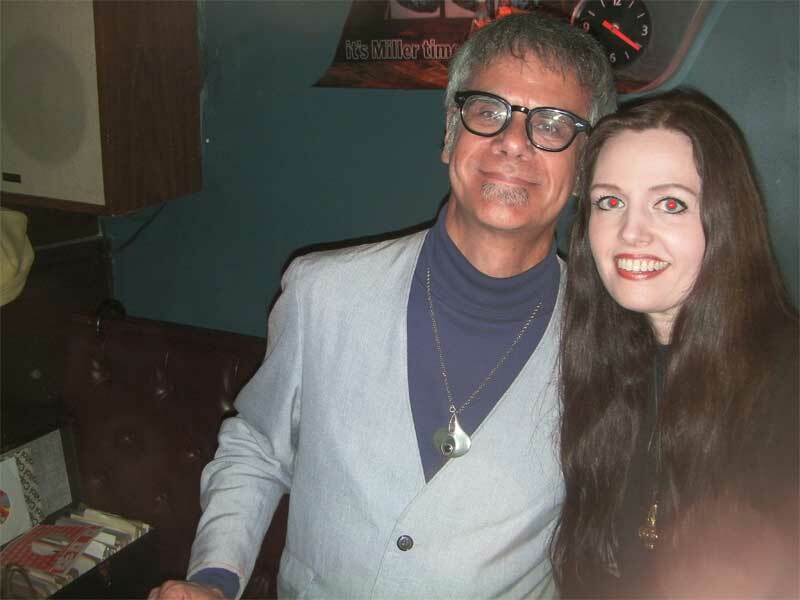 It was for this latter personage that a gathering of hep cats and kittens, curious onlookers and finger poppin’ daddies were gathered on the Friday evening of April 25. 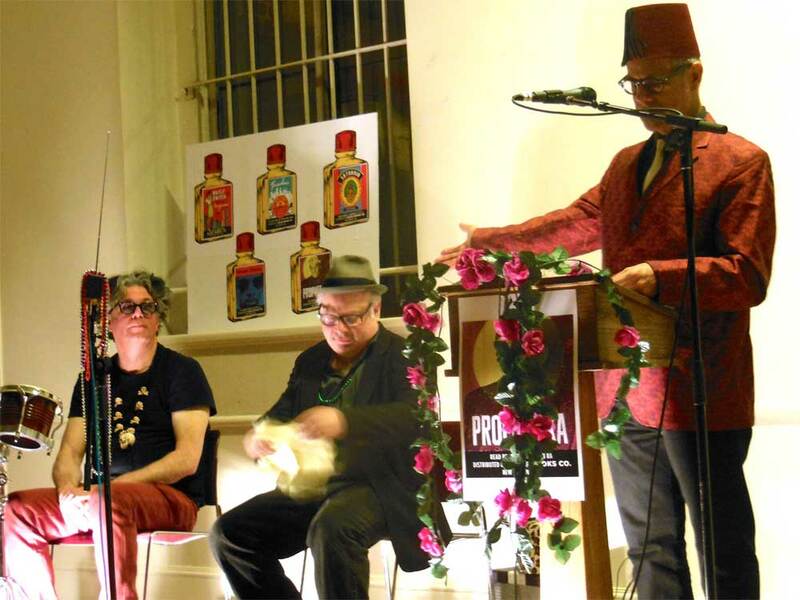 Kicks Books has just issued Prophetika, the lost writings of Sun Ra, and a launch event was in order and it duly took place in the meeting room of St. Mark’s Church in the Bowery under the kind auspices of The Poetry Project. Sun Ra, who is known widely as a far-out jazz musician and bandleader, was also a poet, philosopher and interplanetary traveler of some note. Prophetika is being published in the centennial year of Mr. Ra’s birth. 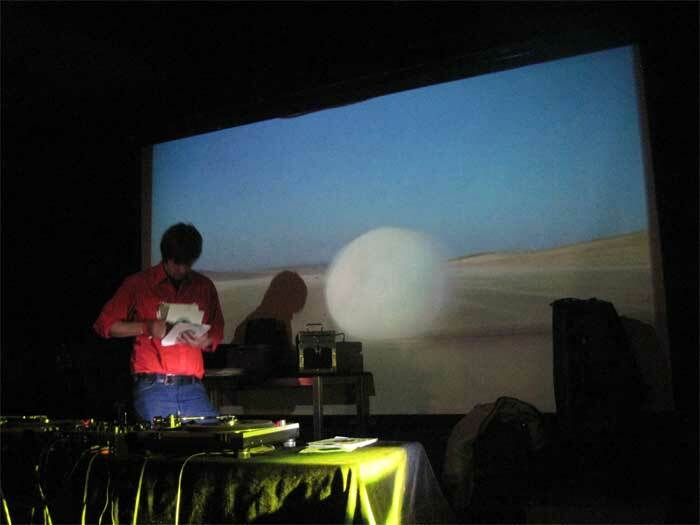 For the event, Ms. Linna rounded up some of Sun Ra’s most fervent fans in order to read his work aloud to the faithful, perform music inspired by his, and to celebrate the spirit of a singular individual whose like will never appear on this world again. Readers were Kicks Books author Charles Plymell, musician/writer Mike Edison, guitarist Mick Collins (Gories, Dirtbombs), Boston rock ‘n’ rhythm shouter Barrence Whitfield and Phast Phreddie the Boogaloo Omnibus, who also served as the master of ceremonies. Through much of the night, The Rocket Train Delta Science Micro Arkestra (Mr. Edison, who played Solar Space Theremin and percussion, and the esteemed bongo player Bob Bert) added aural punctuation in all the appropriate places. The Rocket Train Delta Science Micro Arkestra swings as Phast Phreddie introduces Sun Ra and guest speakers at the Prophetika book launch! Photo by Kiki Lenoue. A confirmed Sun Ra follower since having been initiated as such in high school, Phast Phreddie the Boogaloo Omnibus read from an interview he conducted with Sun Ra back in the late eighties and then recited Sun Ra’s poem “The Universe Is Out There Waiting,” and blew his C-melody saxophone while the lovely Nancy “Jeannie” Gardner shook her maracas and interpreted the words with artful choreography. Dig that action HERE!!!! Although Sun Ra has been physically absent from Earth for about 20 years, his presence was most definitely felt in the room. 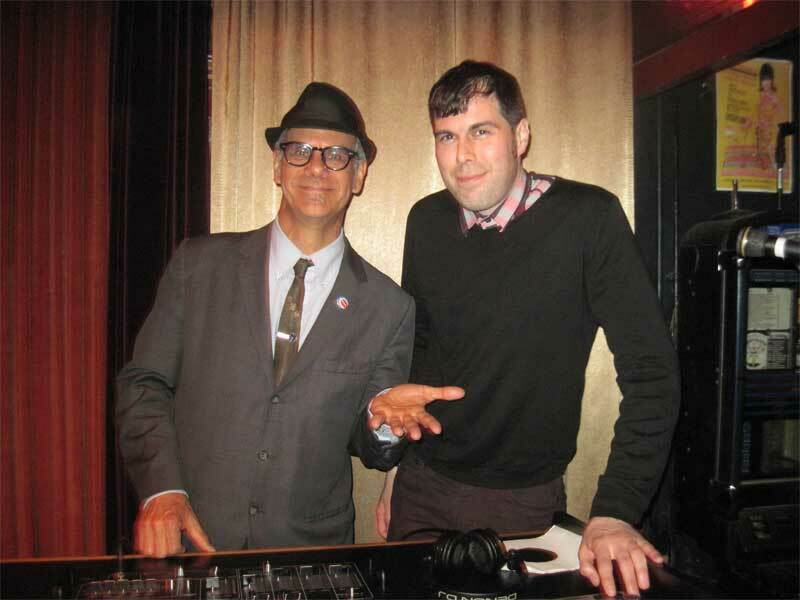 When the festivities were over, many of the Sun Ra devotees made the scene at a super-boss after-party at Home Sweet Home, where our pal Jonathan Toubin was in full swing with his Shakin’ All Over Under Sideways Down night of rockin’ R&B records. Phast Phreddie the Boogaloo Omnibus played a few records, as did Norton Records head honcho Billy Miller—many picked by Miriam Linna—as Barrence Whitfield was seen ripping it up on the dance floor! 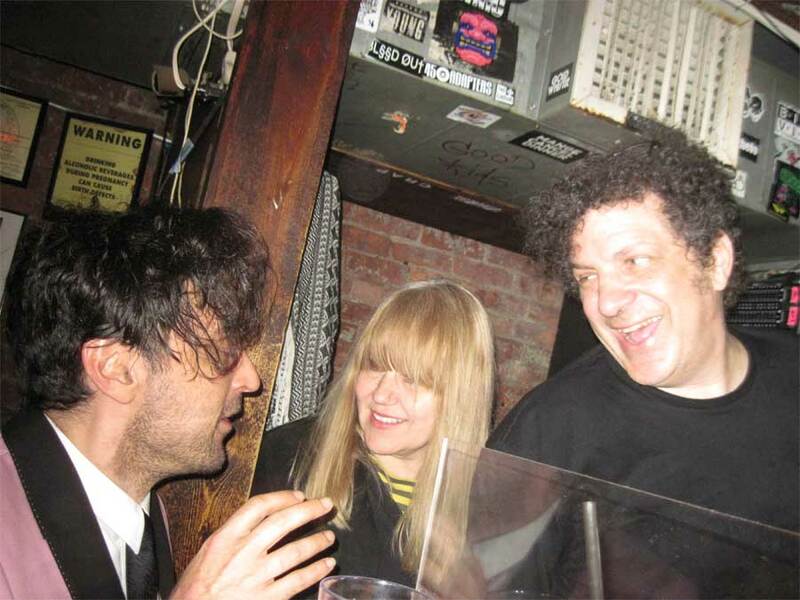 Jonathan Toubin, Miriam Linna and Billy Miller swing at Home Sweet Home. 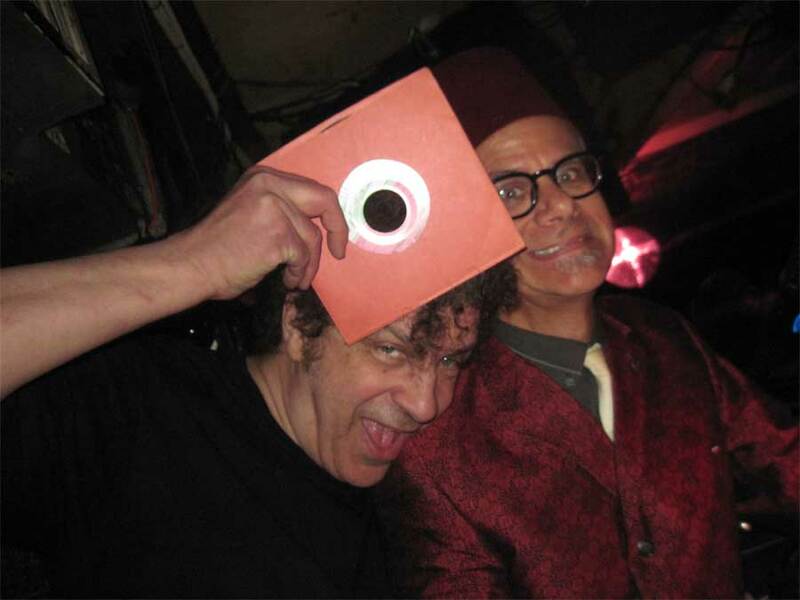 Billy Miller and Phast Phreddie the Boogaloo Omnibus swing at Home Sweet Home. 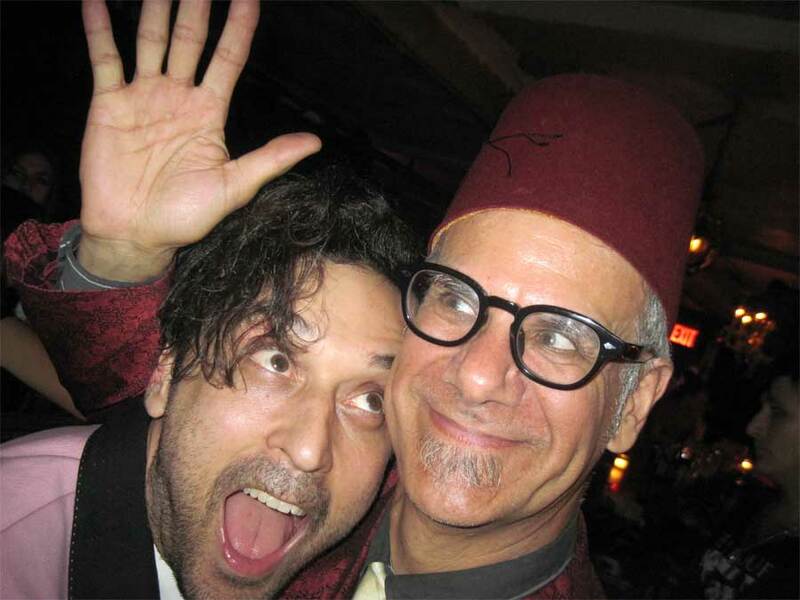 Jonathan Toubin and Phast Phreddie the Boogaloo Omnibus goof at Home Sweet Home! 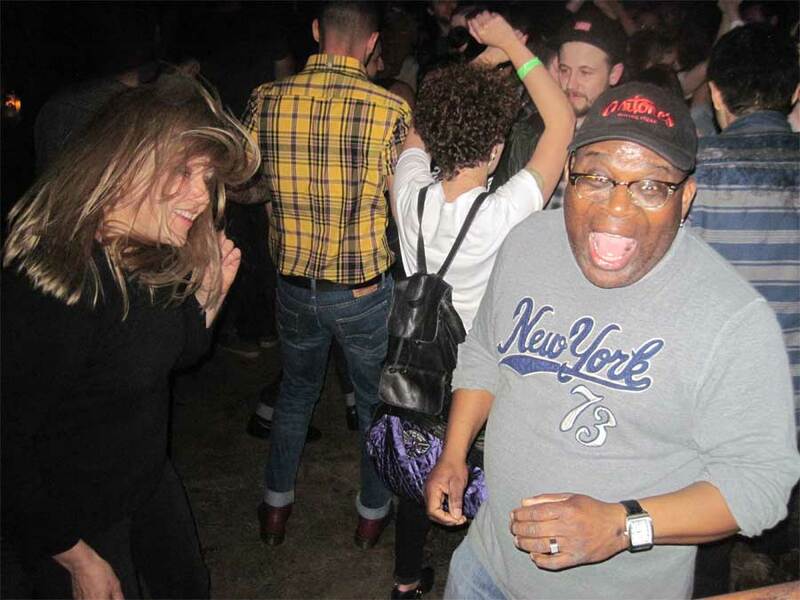 Miriam Linna does the watusi with Barrence Whitfield at Home Sweet Home!